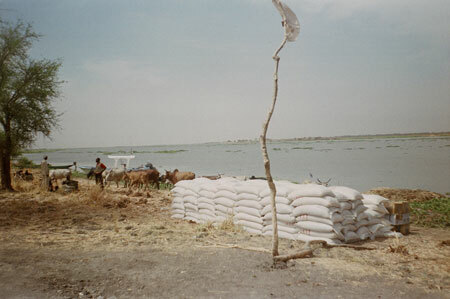 World Food Programme supplies piled on the shoreline at Thac, with a white flag marking the landing point for the village in the foreground. Morton, Chris. "Supplies at Thac village" Southern Sudan Project (in development). 03 Jan. 2006. Pitt Rivers Museum. <http://southernsudan.prm.ox.ac.uk/details/2007.137.65/>.